Meryl Streep gives a great performance as the first female Prime Minister of Great Britain, Margaret Thatcher, in The Iron Lady. It’s another uncanny celebrity inhabitation, like her Julia Child in Julie & Julia, in which what could easily have been nothing but imitation (and don’t get me wrong, it is imitation) goes much further with a genuine spark of emotional interiority. She’s utterly compelling, a flesh and blood human presence at the center of what would otherwise be a totally flat history lesson. What’s a shame about this film is how it so completely lets Streep down. It’s great acting in a film that’s little more than a rote biopic mediocrity. And that’s too bad. Like Clint Eastwood’s J. Edgar, this is a film that tackles a controversial figure of fairly recent history by placing the narrative near the end of life. Here, Streep is in layers of convincing old-age makeup as Thatcher, slowly succumbing to her dementia, has flashes of memories that, luckily for us, progress in a rough chronological order. We see her as a young woman (Alexandra Roach) first getting interested in politics through her grocer father’s conservative stump speeches. On the evening of her first (failed) election, Thatcher sits despondent until a charming young colleague (Harry Lloyd) that she’s been sort of dating sidles up to her and proposes marriage. That’s quite the consolation prize. They stay married until his death, eight years before we first see the elderly Thatcher in the opening scene. Throughout the film she hallucinates his presence as a sweet, daffy, amiable old man (Jim Broadbent) who gives her someone to talk to as we move in and out of flashbacks. We see Thatcher as a housewife with two small children who soon wins a seat in Parliament, then becomes Secretary of Education, and, finally, Prime Minister. Key events play out in matter-of-fact reenactments that plod along one after the other. Fighting against institutionalized sexism? Advocating for spending cuts during a recession? Reacting to IRA bombings? Commanding a conflict in the Falkland Islands? Each political scuffle is dramatized and discarded. The film is directed by Phyllida Lloyd, a theater director who made her feature debut with Mamma Mia!, one of the worst directed films in recent memory. Iron Lady doesn’t suffer that fate. It looks rather nice and is an entirely watchable film, a handsomely inert historical scrapbook. I wasn’t bored; I just wasn’t all that interested. Instead of building into a larger, more nuanced, portrait of a political figure for which there were strong opinions on both sides, the thin script by Abi Morgan tries to walk straight down the middle in a way that only muddles its message and dims the admirable humanity that Streep brings. It’s possible to feel sympathy for a figure of ambiguously negative historical impact without condoning the actions taken. (See the aforementioned J. Edgar). But this film, try as it might, can’t get out of its own way to get there. The film is devoted to detailing her rise and fall as a political figure but it’s strange to see how glancingly the film deals with her actual politics. This is the biggest source of the film’s muddling. Refusing to take a stance or form an opinion on her policies, let alone fully explaining them, reduces the film to scenes of buzzwords and hackneyed political turns of phrase. We never get a sense from the film as to the substances of her political decisions so that by the time Londoners are rioting we don’t get a good sense as to why. Outside knowledge is a necessity to decoding the film, which only makes its failings clearer. By not exploring the political ideologies and historical context of Thatcher’s reign, it’s an implicit endorsement that doesn’t sit too well with me. I respect her accomplishments while not agreeing with most of what she did once she was in power. But the movie neither affirms nor challenges my preconceived notions of Thatcher. By not exploring her legacy, the film hedges itself into a corner. It’s may be a movie about a tough woman, a determined woman, an iron lady, if you will, but it’s a fatally soft movie that all but disappears on impact. It has no point of view, nothing to say, nothing it wants to explore, nothing, even, that it particularly wants to show us. If it weren’t for Meryl Streep giving it her all, the film would be hardly worth mentioning. Her performance is moving and memorable in ways the film can only pretend to be. If I hadn’t known that 70-year-old Chilean director Raúl Ruiz was dying as he made Mysteries of Lisbon, would I still have found it so playful and wise, so clearly the work of a man urgently but effortlessly saying all he could while he still had time? I suspect I would. Here’s a film that’s so beautiful and complex that the narrative could slip away from me for minutes at a time and rather than focusing on the convolutions I simply floated along with the mystery of it all. Set in nineteenth-century Portugal, the film is adapted by Carlos Saboga from a nineteenth-century novel by Camilo Castelo Branco, a novel that is sadly unavailable in English translation. But watching the film felt like reading a thick, complicated text of the time, filled with characters and incident, moving forward with an ornate formalism and a studious thematic coherence. 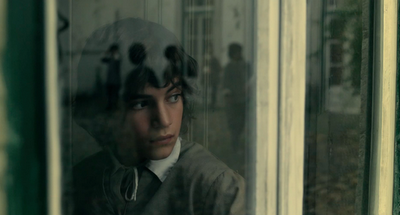 It starts with an orphan boy (João Luis Arrais) living in a boarding school run by the soft, unassuming Father Dinis (Adriana Luz). The boy, in Dickensian fashion, wonders about his origins and says as much to the kindly Father, who promises that all will be revealed. And so it is with this mystery that the film begins. At first the answer seems to point simply to the story of a countess (Maria João Bastos), who secretly visits the boy at the school when he’s sick. She brings him a miniature theater, a richly adorned toy proscenium and stage upon which brief moments of the following story is imagined in light fantasy embellishments to take place, little two-dimensional figures moving between stage sets. After all, the story soon grows more complicated than one of the young boy’s parentage. It fills with a sort of casually theatrical melodrama of an artful kind, soon including soldiers, pirates, lords, ladies, nobility, poverty, wars, affairs, and entanglements of various sorts. Growing to encompass nearly four and a half hours, helpfully split into two parts, the film finds plenty more mysteries to concern itself with. A character will often exclaim that now is the time to “explain.” Will this be the time that all will be revealed, secrets disclosed, an orienting flashback will clarify rather than deepen the engaging, mystifying sprawl of the plot? Maybe, but then again, it may as well not. From its very title, this is a film that announces its dedication to mysteries and encourages wondering, questioning, searching. Ruiz’s camera is fluid and visually alive. Shot with a gorgeous, clear-eyed use of digital by André Szankowski, the takes are long and flowing, with lengthy shots during which the camera is in near-constant, but often subtle, motion. It will sweep across a scene, sketching the emotional territory and the physical spaces with equal ease. Conversations are modestly arranged; scenes more often than not play out with only two or three people in a room. But the film’s scope expands beyond the boundaries of each interaction, each little room. There’s a sense that the camera, like the narrative, could easily and quickly dash off in a new direction, revealing new corners to explore. At one point the camera slides between two rooms, right through a wall. We see a servant standing between the rooms in what appears to be the middle of the wall. It’s only then we realize that it’s a staircase from which he could hear both rooms unseen. New information and new corners of the architecture are revealed. The film builds its structure out of stories within stories within stories, only some of which are fictions, or maybe fever dreams. Or are they? It’s novelistic. It’s experimental. It’s a soap opera. That it’s all of these and none of these is it’s greatest charm. Characters come and go, truths shift, or were they only assumptions? Everyone has a story to tell, but whom are they telling and for what ends? Just keep watching. It may or may not all sort out but it’s the telling that counts. The film opens with a man announcing credible reports of troop movements, immediately following it up with credible reports of no troop movements. This is a film interested in the value of a story, even and especially if the story seems circuitous or deceptively contradictory, insisting that stories are all we have. Lucky McKee is a welcome peculiarity on the modern horror landscape. He manages to make artfully upsetting movies that wriggle away from easy classification all the while maintaining a deeply felt personal stamp. His early breakthrough was 2002’s May, a movie about a lonely, troubled young woman that plays out under a fog of memory in a way that teeters on the edge between dreamlike and nightmarish. I also enjoyed his 2006 feature The Woods. It puzzlingly went straight to DVD, but that doesn’t mean it’s bad. On the contrary, it’s a creepy all-girls boarding school movie with a thick tangle of foreboding atmosphere. His newest film is The Woman, perhaps his most twisted film yet, and that’s saying something. It debuted at last year’s Sundance where it made news for the man who stormed out of the screening yelling and carrying on. The movie just plain made him furious. Before he was escorted out of the building, he shouted, “You are sick! This is not art! You are sick! This is a disgusting movie! Sundance should be ashamed! How dare you show this!” and more invective besides. There’s footage of this in the bonus features on the Blu-ray so you know the filmmakers weren’t too upset by it. After all, The Woman is a provocation. It’s a film about a smiling misogynist psychopath (Sean Bridgers) with a gleaming family man persona masking darkness within. 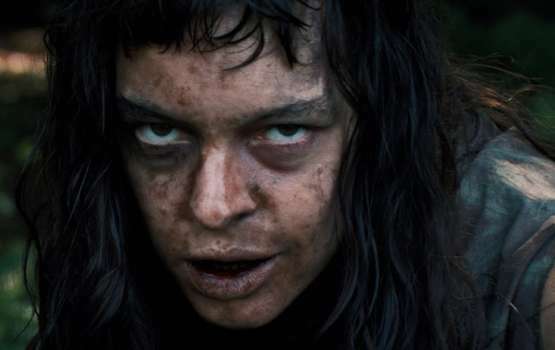 Out hunting one day he finds a feral woman (Pollyanna McIntosh) and captures her. He decides it’d be a good idea to lock her up in the cellar and “civilize” her. She bites off his finger. His family is unsure about this, but decide to go along anyways. They’re under his total control. His wife (Angela Bettis) and teenage daughter (Lauren Ashley Carter) have ghostly cowed looks in their eyes; they’re ground under by his dimpled dominance. His teenage son (Zach Rand), most chillingly, has learned and incorporated his narcissistic, sociopathic, male-dominated, female-subjugated world-view. It’s all kinds of nasty on the thematic level, about how men can keep women under their control in nefarious ways. It’s cruel. It’s a ruinous poison passed through generations of hegemonic power. This woman is locked up and, under the all-too flimsy guise of doing her good, the family is complicit in allowing her to be tortured and brutalized. The threat of the power structure shifting doesn’t even enter into the picture until it’s too late. Then it’s a total bloodbath for all involved, substantial grisly gore strewn about the property leaving no one unscathed. This is an upsetting movie that wants to trouble an audience, to disturb and the distress. But it’s all teeth and no bite. The picture’s primed to chomp down on substantial thematic material but ends up nibbling more than feasting and the blood stays strictly on the screen. I was ready to engage, but left with little to chew on. The films of McKee never want for ideas, but here they fail to actualize, to live up to their slimy, disgusting potential. I was ready to make a defense of McKee’s latest shocker and am instead left unluckily disappointed. Yes, it’s gross. Yes, it has some welcome feminist themes. But it’s such an obvious, surface level provocation, merely unpleasant, that I had a hard time finding it scary, let alone interesting. Red Tails is a creaky, rickety World War II movie. Those are hardly rare, but what makes this one especially disappointing is the way it dives headfirst into one aspect of the war that is too rarely considered and then finds nothing new to say about it, or even entertaining ways to say the old things. The film concerns itself with telling the story of the Tuskegee Airmen, an all black squadron of fighter pilots during a time in which the official policy of the United States Army was that African Americans were unfit for combat based on nothing more than the color of their skin. The film starts with the Airmen flying mostly peaceful patrols far from the front lines. They’re not allowed in situations for which dogfights might be a necessity, which means they’re denied the chance to go wing-to-wing with German fighters. They’re getting antsy. We meet a handful of the pilots, our ensemble of protagonists, each with their own snappy nickname. There’s Easy (Nate Parker), Lightning (David Oyelowo), Ray Gun (Tristan Wilds), Winky (Leslie Odom Jr.), Neon (Kevin Phillips), Sticks (Cliff Smith), Smoky (Ne-Yo), and Deke (Marcus T. Paulk). They’re personalities more than characters, which is disappointing, but it’s the kind of surface-level American cross-section of types that comes with the middling WWII movie territory. They’re good pilots. Some of them are even great pilots. We first meet them flying across the fields of Italy running a routine patrol. They’ve only blown up one little Nazi truck when they cross paths with an innocent-looking train that becomes a whole lot less innocent when Nazi anti-aircraft guns in the back car open fire. They dip down and manage to not only derail the train, but to blow it up as well. But it’s all so unsatisfying. How embarrassing to be simply “shooting traffic,” as one pilot grumbles. Their commanders agree. Through the commander of their base in Italy (Cuba Gooding Jr.) to a D.C. liaison (Terrence Howard), the Airmen make their case to the stubborn, prejudiced brass. Following the true story insofar as it affords the potential for aerial combat, the script by John Ridley (with extra, unfortunately rather personality free work from Boondocks writer/creator Aaron McGruder) pounds half-heartedly through some flavorless cardboard drama on the ground to get these heroes from takeoff to takeoff. Everything between the landings seems tossed aside and half-hearted, conflicts between characters that bubble up in a line of dialogue and disappear entirely forgotten for large periods of time. It’s strange for a movie so thin to feel overstuffed but when a subplot that’s essentially a remake of The Great Escape involves only one character we’ve previously met and lasts all of two-and-a-half scenes, it’s hard to feel otherwise. There’s rich story potential to be mined here, but the movie skips across the surface of deeper resonance on its way to find visceral heroics. A fair amount of the movie contains clichéd fighter pilot dialogue shouted over the roar of plane engines. Anthony Hemingway, who has directed a handful of episodes in several different recent series of note (including The Wire, Battlestar Galactica, and Community), is sitting in the director’s chair and, though he’s no good at figuring out how to outmaneuver the blockheaded clichés of the script, he’s certainly good at figuring out how to stay out of the way of the Industrial Light and Magic CGI battles in the sky. It’s here that the influence of producer George Lucas (who, to his credit, has tried out of his passion for this under-told story to get this film made for decades before finally financing it himself) is most clearly felt. The way these planes fly about shooting at each other, with routine fighter pilot patter howling over the roar of propellers and gunfire feels awfully reminiscent of X-Wings and TIE Fighters zapping at each other in the dark of space. It’s sad to say that those Star Wars space battles are significantly more thrilling than these based-on-a-true-story dogfights, but there you have it. The film feels weirdly inconsequential with a storyline that zips off in too many directions to really make an impact. But the look of the film is a problem too. Shot on digital in a terrible use of the medium, the image is weirdly bright and artificial and entirely textureless. It’s naturally void of the nuance of film grain but without satisfactorily compensating for it by using the unique visual properties of digital a la the recent work of Michael Mann, David Fincher, and Steven Soderbergh (whose Haywire is probably playing the next auditorium over and definitely making far better use of digital camerawork). I was rooting for this movie. It gives me no pleasure to write this. Walking out of the theater, my dissatisfaction made me sad. All the material was in place for a great fun throwback: a terrific story, a fine cast, and a great special effects company. But the filmmakers simply failed to crack the story’s difficulties. The film lacks shape and, though it’s oddly simple and perhaps perversely upbeat, it lacks the momentum and the visceral filmmaking power of the best war films. Truffaut once said that it was hard to make an anti-war film because war looks inherently exciting on film. Not this one. It tries its hardest, and succeeds from time to time, but the thing never coheres one way or the other, or at all. Retired mixed martial arts star Gina Carano is the center of Haywire, a terrifically exciting action thriller. This is essentially her acting debut, playing Mallory Kane, a tough ex-Marine who works for an independent company that is hired by the United States government to execute strategic, secretive missions. She’s a secret agent for hire. Carano is perfect for the role. She’s tough and gorgeous. You don’t want to cross her. She has intensity in her eyes and muscle to her physicality. She doesn’t just look like a fighter; she is a fighter. When her punches land, not only are they convincing, they look like they cause some real pain. I love Salt and Hanna, two recent female-starring actioners, but that doesn’t mean there’s no suspension of disbelief that Angeline Jolie or Saoirse Ronan can really fight like they do in those films. That Carano can really handle herself in a fight is no small fact. It’s the very purpose of the film. Every step of the way, she has to fight off attackers. With simply stunning fight choreography, Carano kicks, flips, and punches her way to freedom. The music drops away, leaving only the grunts, whaps, and thunks to score the action. There’s a tantalizing eeriness as the camera stands back and regards with a restrained stillness that suits the judicious editing. The diegetic sound is all we need to feel the full force of these knockdown drag-out fights. The film could easily have been a routine story of espionage and double crosses, but it’s so energetically and stylishly told that it’s anything but. Directed by Steven Soderbergh from a smoothly complicated script by Lem Dobbs (they last worked together on The Limey, another great thriller), it moves with a slick, artful excitement. We start in the middle of things, with Carano getting attacked in an upstate New York diner by a former coworker (Channing Tatum). It unfolds with quick brutal resourcefulness as she kicks him out cold and then demands a cowering patron (Michael Angarano) give her a ride and patch up her arm. On the way to wherever she’s heading, she tells him her story. The film globetrots through flashbacks the reveal that a government bureaucrat (Michael Douglas) hires a security company, headed by a slick suit (Ewan McGregor) consulting with a Spanish counterpart (Antonio Banderas) to rescue a Chinese dissident held hostage on Spanish soil. It appears to be a successful op, and Carano heads off to her next mission, playing wife to an undercover British agent (Michael Fassbender). There she learns she’s being framed for murder charges. She escapes, barely finds the time to call a warning to her dad (Bill Paxton), and then spends the rest of the film on the run, leading us back to where we came in and beyond as she pieces together the conspiracy that put her in this predicament. It’s so sleek and fast, with nary a wasted shot, it’s practically aerodynamic. The action is well staged by Soderbergh, whose films are at least as interesting for how the story is told as for the story itself. His cool digital cinematography and crisp editing have a clinical movement to them, laying out the spaces of the sets with ease and allowing the fights – not to mention the chases, the shootouts, and even simple conversational clashes – to unfold with clarity and cold, blunt observational precision. This is gleaming pop pulp filmmaking, hurtling through familiar tropes with an uncommon energy. It’s just plain fun. And I think Soderbergh and Dobbs had fun coming up with this film too. Carano’s compelling athleticism may be the driving engine of interest here, but the pleasantly jumbled chronology of the plot, the precision of the shots, and the deeply talented supporting cast are just as compelling. There’s a fleeting moment when, during a chase scene, an animal darts across the road. It’s a perfect, whimsical moment that’s at once a lovely visual detail, a funny little gag, and an escalation of tension. Soderbergh creates frames that are composed to have information in the background like this to heighten the experience of watching. He doesn’t overwhelm you with visual noise. He invites you to look closer. A moment during a rooftop foot chase finds Carano slinking through the foreground while we can see, tucked away in the corner of the frame, her pursuers a few roofs back. Neither the pursuers nor the pursued has the whole picture, but there’s a thrill in understanding the layout that enhances the stakes. (The moment is twinned in the climax when Carano comes hurtling from the background, smashing into the unaware villain in the foreground). Steven Soderbergh films are about the stakes inherent when people are very good at their jobs (Erin Brockovich, Ocean’s 11, 12 and 13), which makes it all the more troubling when things go wrong (Contagion, Out of Sight), when people who may at times seem competent aren’t (The Informant!, Bubble, Solaris), when we question the value of what they do (Traffic, The Girlfriend Experience). All of the above applies to Haywire. Gina Carano is very good in a fight, but when she beats a path through her former coworkers, barely escaping with her life, it’s destabilizing. She’s been cut loose from her company and her extralegal status does her no good. She may have skill, but the system itself is broken. The very classification that allows the company to do whatever it wants in the name of national security is of no help whatsoever to her. This confident and capable woman has only so much fight in her. She can only run for so long. Confidence and capabilities will mean nothing if she can’t prove her innocence and uncover the corruption. And that’s what makes the movie work so well. Carano has incredible action star charisma. I believed she could beat up anyone she needed to. But the resolution of the conflict doesn’t rely solely on her physical capabilities. She makes a compelling center of rooting interest in an ensemble made up of people of cold, calculating sliminess. Much like the film itself is proof of the coolness of verisimilitude in a genre of pretenders. The hardest part of finding yourself less than completely bowled over by a film that has been nearly universally loved is resisting the temptation to impugn the intelligence or the motives of those singing praises. In fact, when I walked out of The Artist, a French tribute to silent Hollywood filmmaking, I found myself grumbling that it was a silent movie for people who’ve never seen a silent movie. I recognize that’s entirely unfair of me. After all, plenty of learned critics (including some of my favorites like Roger Ebert, A.O. Scott and Stephanie Zacharek) loved it and they’ve seen more than a silent film or two in their lives. But my grumbling hyperbole, directed at a movie I did indeed enjoy, mind you, got at something really hollow at the film’s core. I don’t doubt that writer-director Michel Hazanavicius loves classic Hollywood filmmaking. Nor do I think that this well intentioned and undeniably fun movie is anything but what he intended. It’s a gimmick, a silly little filmmaking exercise that happens to have some charismatic performances and a good-natured sense of cinematic play. But it sure isn’t anything more than that. Some of us first came to know about Hazanavicius with his OSS 117 spoof films, the first, Cairo, Nest of Spies, arriving on our shores in 2008, with the second, Lost in Rio, following two years later. These were based on a French spy character that predates and, in some ways, set the formula for James Bond. Transposing him into a post-Roger Moore, post-Austin Powers cinematic landscape while setting the films in post-World War II, Hazanavicius wiggled around irrelevance ever so slightly, though the finished product is undoubtedly touched by it. As the agent, Jean Dujardin plays straight-faced sexism, ethnocentrism and casual disregard for the well being of anyone but himself and his mission with a charming physical grace and a winning smile. These are loose goofs, but they’re thin and silly in just the right lazy proportions. The gimmick of The Artist is that it’s not just a tribute to Hollywood silent filmmaking set in the 1920s. It is a silent movie, a black and white, Academy Ratio, silent movie. And that’s cute. This self-reflexive film stars Dujardin as George Valentin, a silent film star who’s a kind of Gallic Don Lockwood. He’s a huge star who bumps into perky Peppy Miller (Bérénice Bejo) at a premiere. She’s just a fan with a crush looking for an autograph, but the next day she steps out of a lineup of potential extras and proves her worth with some nice tap-dancing moves. Soon she’s moving into bit parts, which turn into supporting roles and finally deposit her as a shimmering star in the Hollywood firmament. Her rise is juxtaposed with Valentin’s fall as talkies rush in. He refuses to adapt. No one wants to hear him talk anyways. But that Peppy! People would watch and listen her do just about anything. The camera absolutely loves Bérénice Bejo. She’s a beauty, yes, but that’s not the whole story. She has a rare quality that draws attention without upstaging her character. She sparkles on screen in a way that makes her just plain likable. And Dujardin, for his credit, is a fine screen presence with a nice silhouette and good physical expressiveness. He’s a believable silent star. But Bejo’s a natural, much like John Goodman and Missi Pyle who are so funny and charming in bit roles as a studio head and a spurned starlet that I would have greatly preferred a film focusing on them. There are two astonishingly beautiful moments of cinematic delight to be found in The Artist. One involves a startling, strategically isolated use of sound effects. The other, a sweet little evocative moment of displaced romance as Bejo slips an arm through Dujardin’s empty coat hanging on a rack and embraces herself in a fantasy-tinged longing caress. These two simple, effective moments are the kinds of expressive invention that actual silent films could achieve. But The Artist doesn’t stay on that plane of existence, instead settling into cheap imitation. It doesn’t use its gimmick for anything more than placing quotes around old-timey and trotting out an “ain’t we cute” attitude. And, yeah, it’s cute. But it’s also exasperating. I love silent film as much as I love the talkies Citizen Kane, Vertigo, or Singin’ in the Rain, other great films that Hazanavicius apes here. (There are also hints of Rebecca and Sunset Blvd, the work of Frank Borzage and the more realistic films of F.W. Murnau wafting throughout). It’s a hodgepodge of intermittently anachronistic classic film references and it’s a sloppy homage to Hays Code Hollywood throughout. Even that’s punctured in the early moment when Missi Pyle flips the bird at Dujardin. The sharp black and white cinematography from Guillaum Schiffman and the production design by Laurence Bennet isn’t quite Hollywood classicism but it’s similar enough that if you squint a little it’s mostly indistinguishable from the real thing. It’s a frustrating film that uses the charms of its cast and the novelty of its construction to coast on charm alone. At least Hazanavicius is aware that silent film is more than the reductive concept that exists in some ignorant corners of the popular imagination, a view of scratchy prints with dinky music and endless intertitles. He clearly loves cinema and knows better, which is why it’s so frustrating. This fairly short charmer of a film grows endless and when the charm wears off there’s nothing much left to care about. The small surprise of Contraband, a one-last-job heist movie (yes, one of those), is that it’s marginally clever, reasonably engaging, and filled with enjoyable little bits of character acting. It’s not great, and it’s hardly what you could call believable, but it has a somewhat authentic griminess, a couple neat twists, a few halfway decent thriller setpieces, and it held my attention. It’s a modest studio thriller with slimy bad guys and likable antiheroes going through a familiar plot. I doubt I’ll remember much about it next January. I feel it slipping away from me even now. But then again, you never know. It stars Mark Wahlberg as a talented smuggler who now runs his own security company. He’s given up the game to focus on keeping his wife (Kate Beckinsale) and their two sons safe. Unfortunately, his wife’s brother (Caleb Landry Jones) has run afoul of a mean low-level crime boss (Giovanni Ribisi) who demands repayment for a missed shipment of drugs, threatening to come after their whole family if he doesn’t get the money in a timely manner. With the help of another rehabilitated criminal (Ben Foster), Wahlberg is able to gain employment on a freighter to Panama with a crew that includes his brother-in-law, his actual brother (Lukas Haas), and a few other guys who will try to help him sneak a lot of counterfeit money past the suspicious captain (J.K. Simmons) and back into the port of New Orleans. It’s supposed to be a simple job, after which Wahlberg can pay back the baddies and comfortably leave criminality behind him. You might be able to guess that it won’t be that easy. Baltasar Kormákur, an Icelandic actor and director who starred in, but didn’t direct, the original Icelandic film upon which Contraband is based, directs the film. He and cinematographer Barry Ackroyd (who also shot The Hurt Locker, so the one really cool super-slo-mo explosion is less rip-off and more repeat) give it a blockheaded shakiness, animating it with a kind of slick pulp dread. I particularly liked the way they handled the portions of the film that take place on the freighter itself, finding some thrill in the process of clomping up and down the halls, trying to smuggle the goods past the crew members who aren’t in on the secret plan. During a brief time off the boat in Panama, the imagery opens up with dusty sunshine. There, Wahlberg and company get caught in the crossfire of an overlapping heist when local robbers in duct-tape masks (led by a sort of funny Diego Luna) fire back at a heavily armed police force. It’s a brief scene of urban warfare that unexpectedly put me in mind of Michael Mann’s Heat. Of course, this is no Heat, but it has a similar overarching concern with the viability of criminal lifestyles (though it’s not interested in the substance of that idea) and also a big cops and robbers shootout in the middle. Even at its sleaziest, when Kormákur stages scenes of children in danger and a last-minute damsel in distress with a slimily brutal effectiveness and overkill, this is a film that makes room for its character actors to make choices. (But not poor Beckinsale, in a dull worried wife role; she gets next to nothing to do and still gets punished by the plot for it). Are the supporting players’ choices always for the better? Sometimes yes, sometimes no, but at least character actors are doing what they do best, injecting personality into the proceedings. That’s what helps to bring the movie up to a level of adequacy it would otherwise have struggled to achieve, even with the fairly propulsive filmmaking. It all helps to distract ever so slightly from how slight it all is. Ribisi gives a squirrely, nasally quality to his role that makes him as pathetic as intimidating. Simmons has a choppy but bumbling voice here that doesn’t dull his ease with sarcasm. I guess what I’m saying is that between interesting voices in the supporting roles, fun little details like duct-tape masks and neat little thriller moments that involve fairly believable, if improbably successful, smuggling switcheroos, there’s enough to Contraband to count it as a reasonably diverting midwinter midlevel studio programmer. Dolly Parton hasn’t had her big hair on the silver screen in twenty years. Though she’s clearly had some work done to her face, her screen presence is unchanged. She’s dynamite. In Joyful Noise, she stars opposite Queen Latifah as members of a church choir on its way to winning a national championship. Parton and Latifah could be a great match in a better film. They’re actresses who can go big without going over-the-top and can sell feisty one-liners with a nice blend of warmth and prickliness. (They're also often better than the kinds of movies they appear in). The choir finds some obstacles, sort of, and complications, most definitively, but these ladies just want to perform and who could ever stop them? The plot finds nearly constant reason to, but when the movie finally gives them the chance to open up their singing voices to a full blast, it sings too. What’s strange is how much time the movie spends not singing. During the lulls, things get weird. Writer-director Todd Graff (most recently of Bandslam) takes a simple, thin story and loads it up with so many tangents, half-hearted thematic concerns, and dropped plot points that the whole clunky thing is perpetually on the verge of collapse. It’s an awkward joining of some disparate good ideas and a whole bunch of bad ideas into one tonal mess that sloshes about from flat attempts at comedy to thudding dramatic moments and back again within even the same scene. It’s just so weird, as weird as the soft and bland visuals. The movie opens with the choir director (Kris Kristofferson) having a heart attack on stage and then goes on to contain any number of inexplicable plot elements that collide and combust every which way. This is a movie that contains a scene in which a man dies after a one night stand and leaves the poor woman who finds him dead in her bed crying at his funeral because she thinks all men will be afraid to come near her from now on. And that scene is played for laughs. Yes, you read that right. This is an actual subplot in an otherwise wholesome movie about a choir. It’s a movie that tries to get laughs and tears, even at the very same subject. A sorrowful scene of a closing mom-and-pop hardware shop is followed immediately by a wacky slapstick fight in a restaurant that gets a waitress fired, ending on a note so half-hearted and comedic it’s practically scored with a sad trombone. Taking center stage in this tone-deaf movie is Latifah as a struggling mother with two jobs and two kids, a teenage boy (Dexter Darden) with a conveniently cinematic version of Asperger’s syndrome and a talented but marginally unhappy adolescent girl (Keke Palmer). Sharing the spotlight is Parton as a sassy widow and her interloping bad boy grandson (Jeremy Jordan). These two women are confident but troubled as they try to handle family problems while getting the choir in a good position to win its competition. They’re strong, independent ladies and it’s inevitable they’ll clash, especially since the daughter and the grandson have made googly eyes at each other. But the characters never really come alive. I didn’t buy the young romance and I certainly never believed that these two sweet, funny, musical ladies would actually have the kind of animosity they’re supposed to have based on the slim evidence resented. The characters’ personalities shift depending on the needs of any given scene, which slides around as erratically as the movie’s mood. At least they have something resembling a personality, which is more than you can say for the supporting cast that is filled with mostly anonymous glorified extras who are lucky if they get a one-note running gag. But when the big choir competition climax comes and the ladies lead their flock in a rousing off-the-cuff mash-up of pop music and gospel sentiments, it put a smile on my face and a tap in my toes. There’s huge talent in this movie, but I can’t for the life of me figure out why the messy, erratic plot insists on hiding it behind a bushel of ridiculousness. Under chilly gray skies at the height of the Cold War, an assignment goes wrong. A British agent (Mark Strong) is shot down outside a café in Budapest and the head of MI6 (John Hurt) is forced out in the ensuing blowback. At his last meeting before his forced retirement, the old man declares that he’s taking Smiley with him. That would be George Smiley (Gary Oldman), a deputy head of the intelligence service. He’s the graying, bespectacled gentleman on the back half of middle-aged who registers the news with the slightest turn of his head. What is he thinking? That’s the question that resonates throughout Tinker Tailor Solider Spy as Smiley, after being forced out of his job, is secretly approached to head up an investigation into some devastating information. It turns out that one of his former colleagues, indeed one amongst the select group of men who are in charge of the whole Circus (a codename for MI6 headquarters), is a Soviet mole. Smiley accepts his assignment with the same impenetrable gaze, the stiff upper lip and quiet resignation to duty, as he did the news of his forced retirement. That tilt of the head in his first scene speaks volumes. Not only does it set up a character who draws you in through his apparent frailty and quiet dominance expressed through his deliberate, considered actions, it sets up a film in which small decisions, slight movements, quiet moments, speak loudly and dramatically. This is one of the best directed – tightly controlled without ever being heavy-handed – films of the year. Swede Tomas Alfredson, whose modern vampire film Let the Right One In is a masterpiece of restraint and visual imagination, makes Tinker Tailor a vital and exquisitely composed thriller of great patience about a vampiric profession. It portrays the spy game as a drab office job with life and death stakes that slowly drains the passion out of people. One spy, played with a sapped vitality by Tom Hardy, returns from a botched mission behind enemy lines during which he had an affair with a beautiful Russian woman (Svetlana Khodchenkova). In flashback we see the reluctant rush of warm romance that overtakes them. In the present, Hardy’s cold eyes sell the impact of the aftermath. This man has been ground under by the job, by the violence he’s seen and the moral confusion he’s had to endure. Compare that to the wiry energy of a young spy who works a desk, as played by the delightful Benedict Cumberbatch. He’s secretly helping Smiley and, though he doesn’t go into the field, his analog research through pages and volumes, smuggling files out of a secured library, has its dangers. As he becomes more aware of the danger the unknown mole could pose to him, the constant surveillance he may be opening himself up to, he realizes that he’s forced to play the spy game even in his own office amongst supposed allies. The main difference between the English and the Soviet spies here are only the teams they’re playing for. Political ideology goes unmentioned. The game itself stays constant. It’s a tightly restrained game that favors the cold and devious and will demand your participation even if you weren’t expecting to play. That’s what makes Oldman’s masterfully understated, occasionally downright catatonic, central performance so effective. In his silence and patience, his interrogative calm, you can see gears of investigative thinking turning behind his eyes. His large glasses form a protective dome that allows him to represent himself as weaker than he really is. His calm demeanor cloaks a complex interiority. On the rare occasions he raises his voice the impact of the shift in volume is startling. When, in a flashback, he spies a hurtful personal revelation about his marriage, the emotion breaks through his face with such shattering swiftness that it’s clear that this is a man who uses restraint and calm to mask deep personal feelings. He never speaks about this revelation, just as he never needs to sit and explain his thought process in his ongoing clandestine investigation into the identity of the Soviet mole. Each of the suspects (David Dencik, Colin Firth, Ciarán Hinds and Toby Jones) has potentially damning evidence to be considered. But to whom does all this evidence point? Without talking us through his thought process, Oldman makes it all so quietly clear. This is a top-notch mystery, a pleasurable espionage puzzle. Screenwriters Bridget O’Connor and Peter Straughan had their work cut out for them, condensing the original John le Carré novel, which already filled a 1979 miniseries with Alec Guinness, into a little over two hours. I’ve yet to encounter the story through either of those earlier tellings, but the filmgoing experience was exceptionally satisfying. It’s complex and understated, yes, but I didn’t find it confusing or overwhelming at all. Alfredson uses the lean and dense screenplay to layer in flashbacks, including to an increasingly poignant office Christmas party, to lay out all the pieces of the puzzle then allows them to snap into place with a satisfying thrill. Without sacrificing clarity, Alfredson draws the story in such artful, economical strokes. His tremendously meticulous filmmaking displays remarkable visual clarity and tightly honed soundscapes. Cinematographer Hoyte van Hoytema creates images that are striking and chilling with a deceptive complexity lurking behind their simplicity, much like the situations they dramatize. At one point, Hardy looks across the street at his Soviet target, the man’s apartment splayed out across the way in a Rear Window style. Here is a film in which the characters, no matter how secretive they try to be, are living their lives, running their schemes, to some degree on display for those trying to surveil them. The man who will ultimately triumph is the one who manages to reveal the least as he outsmarts the rest. I’d bet on Smiley. There aren’t many films you’d find from 2011 with the same level of engagement with characters’ emotional lives than Radu Muntean’s Tuesday, After Christmas. This Romanian film follows a middle-aged man (Mimi Branescu) who loves his wife (Mirela Oprisor) and their 9-year-old daughter (Sasa Paul-Szel). The only problem is that he also loves the child’s pretty young dentist (Maria Popistasu). It's a familiar adultery plot. What happens next is nothing more than an intimate slow-motion destruction of at least one of these relationships. Scenes unfold in unsparing single takes that are masterful showcases of understated acting that allows the characters to act and react in ways that communicate loudly yet subtly with the slightest gesture, a hand on a shoulder, a soft laugh, a look of sublimated anger. Muntean’s film has a mundane, static feeling. The first scene of the married couple finds them Christmas shopping. It’s nothing more than an extended look into a common occurrence, which serves as a contrast to our revealing introduction to the mistress in the scene immediately prior, curled next to the husband in bed. Later, a father-daughter trip to the dentist unfolds for far longer than expected, but it gains a simmering undercurrent of tension as the wife has unexpectedly joined them. Soon, though, it’s off to some holiday gatherings. The every-day details steadily accrued give the central scene, in which unspoken dissatisfaction and betrayal comes cruelly roaring to the surface, an awful bite. The film peters out a bit after that scene, though, never quite regaining its harrowing emotional specificity and intensity. The sometimes pokey pacing has the picture poignantly fading away into routine detail over the course of the final half hour or so. Lives have been ruptured, but their futures still beckon. The entirety of J.C. Chandor’s debut feature Margin Call plays like the first act of a disaster movie, the moments when the experts slowly become aware that things are about to go very wrong, that the world of the film is about to explode. In this case, the disaster is all too real, has already occurred, and we’re still living in its aftermath. Set in the fall of 2008, the film takes place over 24 hours in a big financial firm as one analyst figures out just how bad things are going to get. The shocking truth he discovers is that risky bets on mortgage-backed securities and the like are about to come up for big losses. The company is over leveraged. The decisions that are made this night will mean the difference between the life and death of the company, of its workers’ and their families’ finances, and probably for the entire American economy, if not the world’s. Sound familiar? 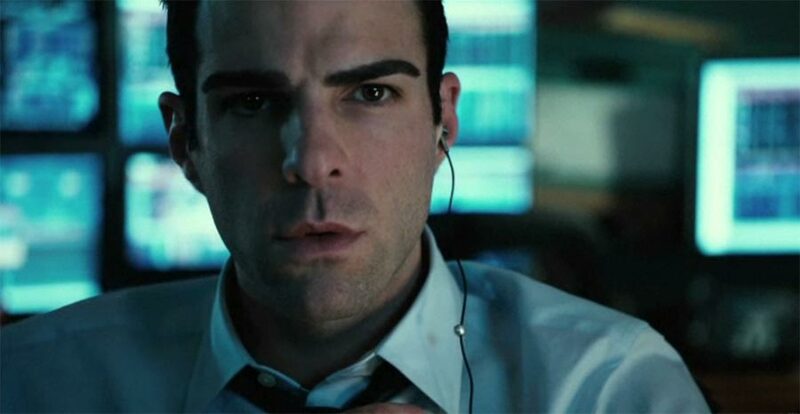 The film starts with a fired risk analyst (Stanley Tucci) giving a flash drive to one of his youngish employees (Zachary Quinto). It contains the formulas that predict impending devastation, the keys to understanding the suddenly very real possibility of complete and total financial ruin for the firm. He passes this information along to his boss (Paul Bettany), who passes it along to his boss (Kevin Spacey), who gives it to analysts (Demi Moore and Aasif Mandvi), who give it to their boss (Simon Baker), who calls in the CEO (Jeremy Irons). It’s an all-star cast (or a close-enough approximation of all-star) ready and waiting for the disaster to strike, repetitively going over their options and weighing consequences. They can see it coming, they can try and slow its approach, but this thing is going to hit and hit hard. Chandor fills the film with tense boardroom scenes and jargon-filled power plays, along with brief moments that play almost like asides, sketching themes too concretely. At one point, during a rooftop smoke break, one suit actually peers over the edge and says, “It’s a long way down.” What this screenplay could have used was characters who were more than just symbols and with more bluntly clever macho Mametian rat race rat-a-tat in their dialogue. (Paddy Chayefsky and Aaron Sorkin are further good examples of the kind of character-driven satirical spark technical talk can sometimes have). The actors – most of them pretty great – are ready to sink their teeth into meatier roles than are provided. This is a film that tries to create characters that are understandable, relatable even, in a film that looks to find empathy but not excuses. It gets there, but it’s all so heavy handed. I believed these actors were the kinds of serious suits who would soberly and gravely use bursts of business speak to tersely and tensely discuss risky financial deals. What I didn’t believe were the moments like the ones when Bettany gives a remorseless little monologue about how people say they want a fair world but “nobody actually wants that,” when Tucci trots out a wistful bridge-building anecdote to make the point that Wall Street produces nothing of tangible value, or when Spacey reveals he has a symbolically significant dying dog at home. The small details of the film are so convincing – the jargon, the drab gray production design, and the simple modern costumes – but the words spoken are so often flat that, try as I might, I simply couldn’t believe the big picture.